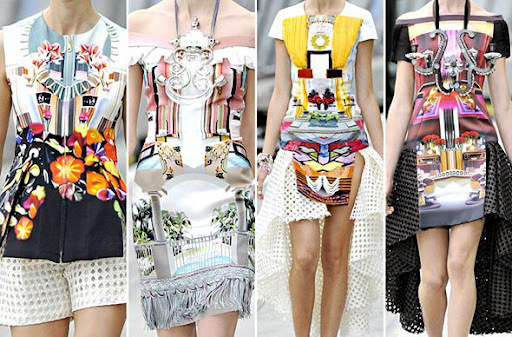 I was speechless the moment I saw Mary Katrantzou Spring/Summer 2011 collection. "C'est Ci N'est Pas Une Chambre" was the tile of the show. In words of Rachel Zoe, "I DIED". Katrantzou (who was trained in interior textiles) incoporated interiors of a room or you say an entire house into her dresses. From lampshade dresses to chandelier statement jeweleries. Trompe-l'œil. I am in awe. It's just amazing! Won't you be happy if you got a huge beautiful house to live in? What's even better? A beautiful house "living" in your dress. Let's hope Anna dello Russo wears Mary Katrantzou to Milan or Paris Fashion Week. I would love love love to see how the dresses translates on the red carpet/streets.